"When There Is Nowhere to Go, Nowhere is Home." Amazon Studios and Participant Media have released an official trailer for Human Flow, a new film directed by iconic Chinese artist/filmmaker Ai Weiwei. This will be premiering at the Venice Film Festival first before hitting theaters in October. This eye-opening, breathtaking, heart-wrenching documentary looks at the humanitarian crisis of our time. "Over 65 million people around the world have been forced from their homes to escape famine, climate change and war in the greatest human displacement since World War II." Human Flow is made up of remarkable footage showing this mass migration and how people move around this planet. This looks incredible, I'm very excited to see the footage and experience it as presented by Ai Weiwei. I'm sure it's going to be an emotional experience. Captured over the course of an eventful year in 23 countries, the film follows a chain of urgent human stories that stretches across the globe in countries including Afghanistan, Bangladesh, France, Greece, Germany, Iraq, Israel, Italy, Kenya, Mexico, and Turkey. Human Flow is a witness to its subjects and their desperate search for safety, shelter and justice: from teeming refugee camps to perilous ocean crossings to barbed-wire borders; from dislocation and disillusionment to courage, endurance and adaptation; from the haunting lure of lives left behind to the unknown potential of the future. Human Flow comes at a crucial time when tolerance, compassion and trust are needed more than ever. This visceral work of cinema is a testament to the unassailable human spirit and poses one of the questions that will define this century: Will our global society emerge from fear, isolation, and self-interest and choose a path of openness, freedom, and respect for humanity? Human Flow is directed by iconic Chinese artist/filmmaker Ai Weiwei, who has previously made many docs including Stay Home, Disturbing the Peace, and Beijing 2003. This will first premiere at the Venice Film Festival coming up soon. 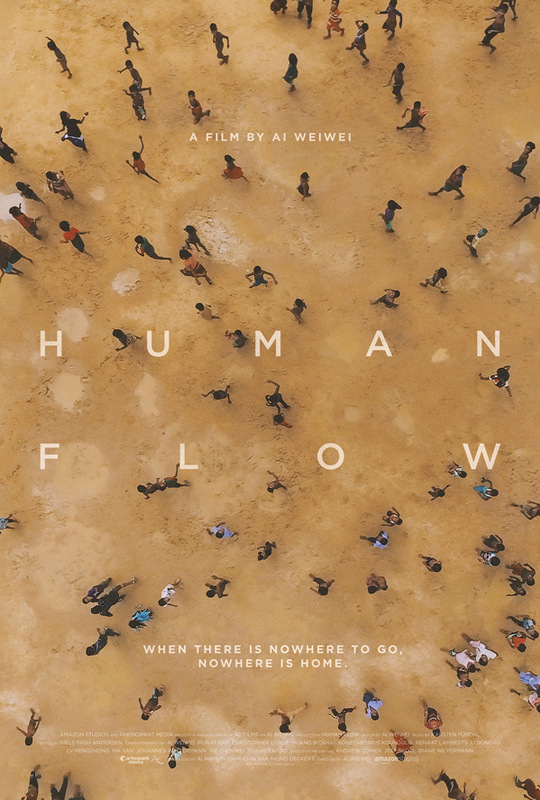 Amazon Studios will then release Ai Weiwei's Human Flow in select theaters starting October 13th in the fall. Thoughts? Want to see this?